Here at Pachinko Planet we take great pride in our ability to restore vintage and antique machines. Our restorations are the best in the business, with over 100 restores under our belt we have the experience and expertise to bring your machine to life. 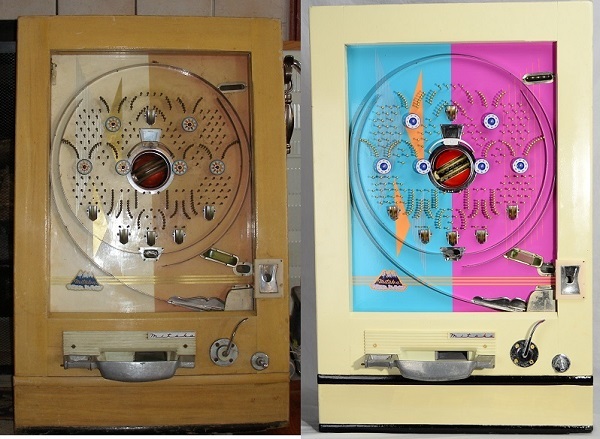 Take a look at a few examples of machines to see what we can do for your vintage pachinko machine. First up is a 1972 Nishijin Aoi Umi (Deep Blue Sea) model. 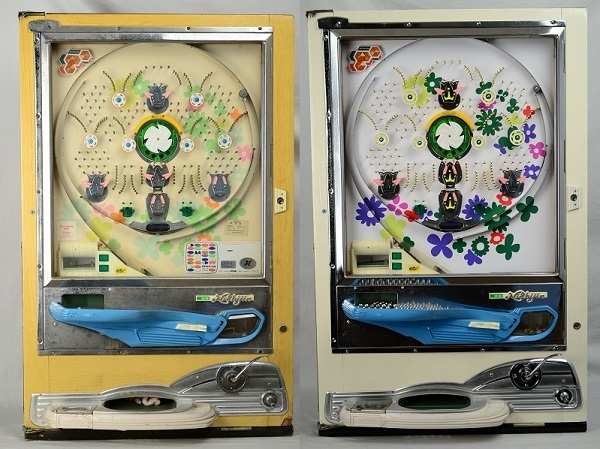 As you can see on the left, the playfield is faded and stained, which is common for machines of this age. The chrome is dull and rust stained, the plastics look terrible, and the wood frame whitewash and varnish has yellowed from parlor cigarette smoke and age. The brass pins are completely black from tarnish. The machine is of course non-functional and unplayable. Now look at the right. A brilliant and shining machine ready to display and play, fully functional with even the lights working as originally designed! This client was thrilled to receive this machine that she had played in her grandfather's basement in her childhood, and now she shares those memories with her own grandchildren! A client found this 1966 Nishijin singleshot at a flea market and wanted it restored because he had played similar machines in Japanese parlors when he was serving overseas. As you can see on the left, time and neglect had taken a heavy toll. The rear mechanics were missing a number of parts that we able to locate and return the machine to full functionality. He now shares the machine with his war buddies who play the game and swap stories about their time in the service, bringing back to life vividly those old memories. An avid collector of antique pachinko machines sent this rare late 1950's Mitaka in for restoration to add as a centerpiece to his collection. as you can see on the left the machine appeared to be in fairly nice shape, but he wanted it restored to original. 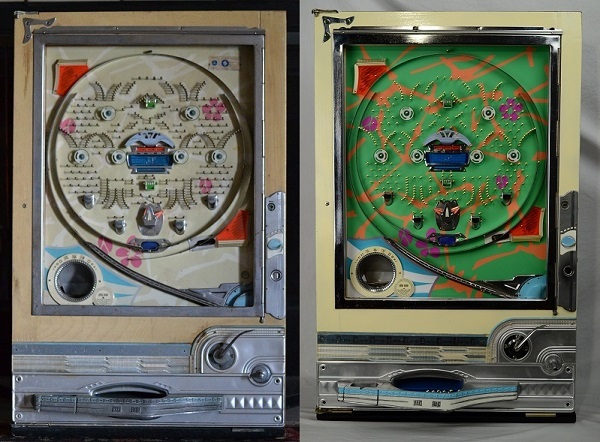 Once we broke the frame apart in the disassembly process we found traces of the original brilliant colors under the wood, and recreated the playfield graphics as they would have originally appeared. It has probably been over 50 years since anyone had seen what this machine looked like originally, and we were honored to retrieve a lost piece of history by bringing it back to life. As a birthday gift to her husband, a client sent these two 1972 Nishijin recyclers to us for full restoration, and also requested the premium cabinet service. 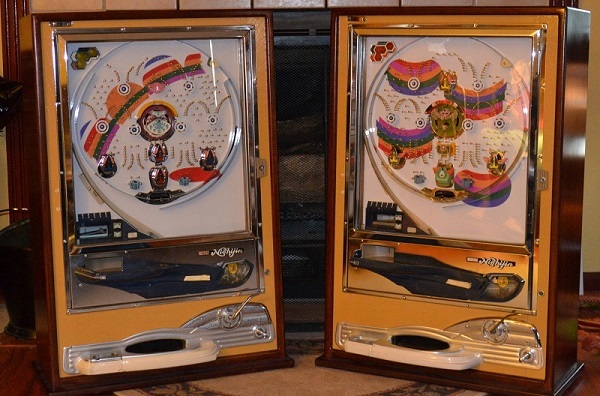 After restoration, both machines were fitted with custom solid maple cases for display in their high-end gameroom. When they entertain, their guests are inevitably impressed by these unique machines, and always want to try them out. Since then we have shipped dozens in custom cases which add a finished look to the machines when displayed. Whatever your reason for having a machine restored, we can provide excellent results in a timely manner. Typical turn-around times are 2-3 weeks, and most machines can be restored in the $600 range. To begin your journey, send a few pictures to orders@pachinkoplanet.com and we will get right back to you with an assessment.